LG Music Flow review | What Hi-Fi? LG is the latest brand to join the multi-room party with its new Music Flow range – the family is made up of H3 (£150), H5 (£230) and H7 (£350) active wireless speakers, an R1 Bridge (£50), and a HS6 Soundbar (£500). Features are in abundance: Bluetooth, built-in wi-fi, DLNA functionality and near-field communication (NFC) across the range. The best bit? All speakers support high-res WAV and FLAC files up to 24-bit/192kHz; topping the Sonos, while matching the capability of the pricier, Award-winning Bluesound system. The price here is the cheapest possible multi-room set-up, consisting of two H3 speakers, but of course you can mix ‘n’ match. 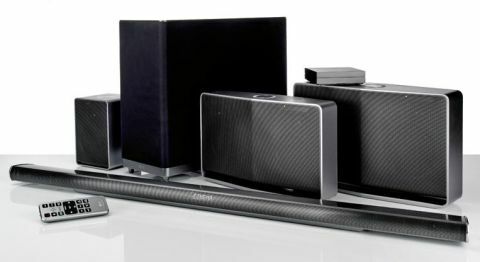 The speakers are primarily for music, but can also be used in a home cinema environment, working with the HS6 soundbar as rear surround channels. (The Bridge isn’t a compulsory purchase for multi-room, but if you forgo it, one speaker in the set-up must have a wired connection to your router) LG claims its mesh network technology and dual band wi-fi (2.4/5GHz) promises stable and ‘uninterrupted’ playback. So far so good, then – but how good is performance? Ultimately, we can’t help but feel a little disappointed with the Music Flow’s sound as a whole. Each speaker delivers a fairly detailed and easily listenable sound that is a bit safe and restrained, lacking the insight, balance and energy of the respective Award winners at their price. We find the small H3’s sound clear, detailed and of a size that extends its physical proportions. But it struggles to match the Cambridge Audio Go’s detail and weight, and overall presentation is a little undernourished. Hints of too much brightness in the treble appear as the cymbals in Jamie Cullum’s Trippin’ Up fill the soundfield, too. Moving up in price and size, we have the weak link in the family: the H5’s bottom-heavy character makes Cullum’s stark, slightly raspy vocals muffled and a tad boomy. We expect more expression, balance and at least an inkling of dynamic aptitude at this price, but the H5 gives us very little to chew on as we feed it the dynamic and intricate The Lord Of The Rings: The Two Towers soundtrack. The marginally cheaper Monitor Audio Airstream S200 (£200) blows it away with its clear, lively and remarkably detailed presentation. The H3’s decent detail levels are in the H5, too, while the H7 is easily the best of the bunch. It delivers the biggest, most dynamic and expressive sound of the lot – and is better able to pick out the subtlety and variation of the piano notes in Regina Spektor’s The Flowers than its peers. You get a deeper – but not particularly better defined – bassline in a 24-bit/192kHz-resolution file of Fleetwood Mac’s Dreams, and balance is better than its smaller siblings. Still, our favourite Geneva Model S Wireless DAB+ one-ups the H7 in almost every way, grasping the genteel, tremulous nature of Alison Krauss’s vocals in That Kind of Love that the H7 largely misses. The HS6 soundbar finds itself in a similar position as its hi-fi counterparts. Load up The Amazing Spider-Man and a good level of detail is present. Spidey’s web shooter is crisp. The soundfield might not be the biggest we’ve heard at this price from a soundbar (Yamaha triumphs there) but LG’s patented Stereo Field Extension (SFX) – designed to create a larger sweet spot and amplify the surround sound effect – seems effective: the sound easily spreads the width of our 65in Samsung telly. Turning the bass down slightly on the sub and ensuring the EQ is set to ‘Standard’ (there’s ‘Cinema’, ‘Flat Boost’, ‘Treble/Bass’ and our second favourite, ‘Music’, too) gets the best balance form the HS6, but we still find presentation markedly underweight. The Q Acoustics Media 4 is £100 cheaper and though it doesn’t have the HS6’s feature count, has a much bigger, dynamic and solid sound – not to mention more insight. It’s a shame about the so-so sound quality across the board, because the Music Flow gets everything else pretty spot-on. Set up is relatively straightforward; we are up and running within a few minutes. There’s no remote for the speakers: the Music Flow Player app (free, iOS and Android) is the speakers’ control hub. This takes you through a beginner-friendly set-up, which finishes with choosing three favourite genres of music and by stating ‘how you are feeling’, so that the app can recommend songs; a nice personal touch, indeed. The app’s interface is pretty straightforward. The sidebar makes it easy to access the device’s files, or music stored over a home network, as well as to add speakers to the set-up and control their playback (one song can play on all speakers or each speaker can play a different song). It’s also a gateway into streaming services like Napster, Spotify, Deezer and TuneIn. The app is prone to being a bit buggy under more complex instruction, like changing the grouping of speakers. It chucked us out of the app on our Apple iPad 4 on occasion when we were juggling playback on all speakers at once. The Android version proved just as flaky during such operations, too. You can access a list of songs you’ve ‘liked’, or get song suggestions according to your ‘mood’– on a Monday morning we picked ‘gloomy’, and it whipped up a playlist of suitably melancholic music. A neat trick is the speakers’ ability to take over the music playing on an NFC-compatible smartphone or tablet by simply tapping it on the top left of the speaker (or on the right-hand side, in the H3’s case). We like the design – the trio of speakers are stylish and well matched with shiny, silver fascias and a rigid chassis that’s sturdier than it might look. The H5 and slightly larger H7 are hexagonal-shaped, and friendly-looking speakers with smooth surfaces and nicely tapered corners (bar a few rough edges we found on our H5 sample). LG has gone for basic functionality; there’s just a single all-in-one button (for power on/off and input changing) at the centre of a volume dial that is smooth to operate and has well-thought-out ridges to stop your finger slipping off. A small white light sits underneath the input icons to show which is in use, though these can be turned off via the app. There’s also LAN and 3.5mm inputs around the back, as well as buttons to connect the speakers to one another. The baby H3 is obviously part of the same family – with its curvy-cornered silver chassis – though it resembles a tiny bookshelf speaker with its cuboidal body. Otherwise, the cosmetic differences are subtle: the volume dial is touch control this time, and the rear buttons are smaller than on the H5 and H7. Perhaps more important is the H3’s lack of a 3.5mm input – connection is via ethernet cable or wireless only. It’s heavier than it looks – despite its small size, it’s hardly hand (or man) bag-friendly. Even the HS6 soundbar looks like it’s cut from the same cloth. The silver (and yes, shiny) bar is a replica of the LG NB4540 (£280), but slightly wider at 102cm – roughly the width of a 48in TV. That’s a good thing, to say the least. Despite being double the NB4540’s price, design is still up to scratch with its rivals – the mirror-like metal body, fronted by hole-patterned grille is as flat and unobtrusive as you’d want a soundbar to be. The bright text display and fancy, yet functional, remote makes it easy to operate, too. With optical, 3.5mm, USB and HDMI inputs and a HDMI output onboard, the HS6 has plenty of options for connecting to your system. The bar’s partnering wireless sub is less familiar: tall, narrow but deep, it’s almost entirely wrapped in cloth and attractive by sub standards. It’s not one you’d necessarily want to hide away – but needs must. LG has gone big on features with its first multi-room model, but the Music Flow goes home with only three stars due to a disappointing performance. Sound quality could be better. Much better. The H7 shows promise, and two (or more) of them would be our combination of choice with the Music Flow. But even then, we’d much sooner pick something from the Sonos or Bluesound line-up for top quality.